It’s been a fair few months since I last uploaded a post – the reason being that I’ve been doing an awful lot of globetrotting! Having stayed still for the last couple of weeks (or at least gallivanted closer to home), I’ve finally had the time to compile my top ten travel experiences of 2014. Whether it was seeing in the New Year fireworks from Sydney Harbour, chomping my way around Vietnam or taking in the dramatic winter beauty of the Scottish Highlands, 2014 was my biggest year of travel to date. I was lucky enough to stay in one of the world’s most luxurious hotels in India, revisit Angkor Wat at sunrise, soak in some winter sun in Marrakech, spend a week skiing in Austria, watch world-class tennis in Paris and travel to Singapore for a long weekend to sample all it has to offer (a lot). So read on for a full account of what I got up to, and make sure to keep following the blog to keep up with my adventures in 2015. I’ve also included some of my favourite instagram photographs from my advensture; make sure to follow me to stay up to date with my adventures. 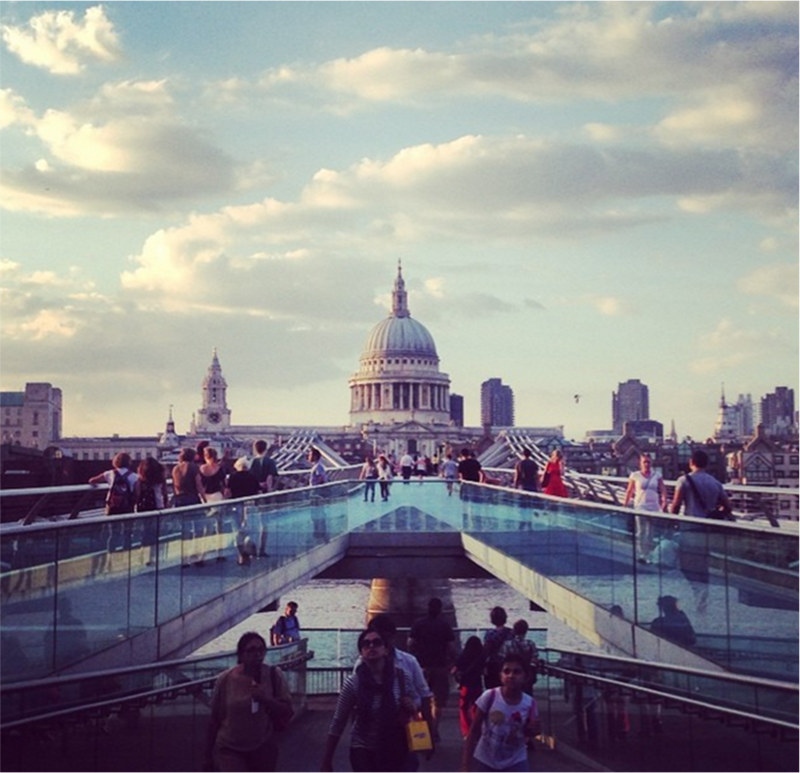 As somebody who has spent the majority of their life living in and around London, I was one of those people who knew that Scotland existed but wasn’t really sure what it was like (apart from that if often rains and that the Scots eat lots of Haggis and black pudding – really awful clichéd stuff). A few trips to Edinburgh during my university days put this amazing city (and one of my favourite in the world) firmly on the map, but it wasn’t until I went on a country-wide tour in April this year that I finally realised just how amazing the country is. My fast-paced five day trip took me through Glasgow, Lake Lomond, Glen Coe, Fort William, the Isle of Skye, Loch Ness and St Andrews before ending in Edinburgh. 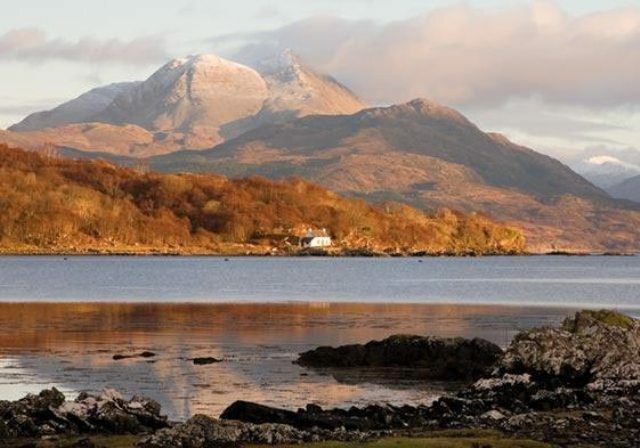 I could write a blog in itself on the marvels of these wonderful places (see a few mentioned here) but I’ll try and keep it to the highlights: drinking divine whisky sours in front of a crackling fire (before a 7 course fine-dining supper) at Kinloch Lodge, eating freshly shucked oysters overlooking the sea on the Isle of Skye, driving through the sublime landscapes of Glen Coe on a beautiful day with a dusting on snow on the ground, taking a hot bath overlooking the gardens of Inverlochy Castle from the comfort of the King Suite, indulging on a black pudding, chorizo and scallop salad in Glasgow, chatting with Scott, the incredibly knowledgeable owner of the delightful Loch Ness Lodge around the fire (with a wee dram of whisky… again) and taking in the endless dramatic and picturesque scenery of the highlands with its purple, gray and oat tones. On a fine day, by the sea, eating fresh seafood and chatting with the locals, Scotland takes some beating. Although just a 45 minute flight from London, Scotland manages to completely transport you to a different world, one which I found completely magical and which I already can’t wait to return to. If, like me, you live just next door but have never taken the time to go, make sure that Scotland is up there on you 2015 travel plans! I am continuously surprised by the ridiculous film-star beauty of Paris. I’ve now been several times but each time the city makes me fall in love with it all over again; things like views of the Eiffel Tower peeking out from behind grand Haussman buildings, ornate bridges over the Seine, cobbled streets that make you hum Edith Piaf as you walk down them, stylish boutiques and clichéd cafes, parks that were designed for strolling through and monuments that you have seen time and time again in the movies never get old. I travelled across the pond this year for Roland Garros, Paris’s answer to Wimbledon. But as always with me, the trip was really about hotels and Paris sure has a lot of those to choose from; Le Bristol (home to a wooden swimming pool and a live-in cat), the Four Season’s George V (which was overflowing with Kardashians when I was in town), Le Meurice (Kate Moss’s favourite when The Ritz is closed), the Park Hyatt, the Shangri-La and the Mandarin Oriental… the list simply goes on and on. My favourite of them all however, and where I would choose to stay (if only I had the A-lister budget) is the Raffles Le Royal Monceau. Combining a classic Haussmann exterior with a wonderfully luxe contemporary interior, the brief of this hotel was a ‘modern palais’ – and that is exactly what it is. Whether you’re dining in the exquisite Carpaccio restaurant, swimming in the heated pool at the hotel’s Clarins Spa or just taking in all the art on show, Raffles is much more than just a hotel. Unfortunately The Ritz, Hotel Crillon and the Plaza Athenee were all closed for refurbishment so I sadly didn’t see get to inspect them, leaving me with a good reason to go back soon. However, no trip is just about the hotels; this trip saw me discovering Ile Saint-Louis, just a stone’s throw from Notre Dame, making my way up to Sacre Coeur (inspired by Amelie Poulin), watching some fantastic tennis and, of course, eating like a queen: I loved Georges at the top of the Centre Pompidou (where we popped in to see the Cartier Bresson exhibition), discovered a sensational tapas restaurant nearby to our hotel, Hotel Nell, and ate my weight in macaroons (my favourite are from La Duree). 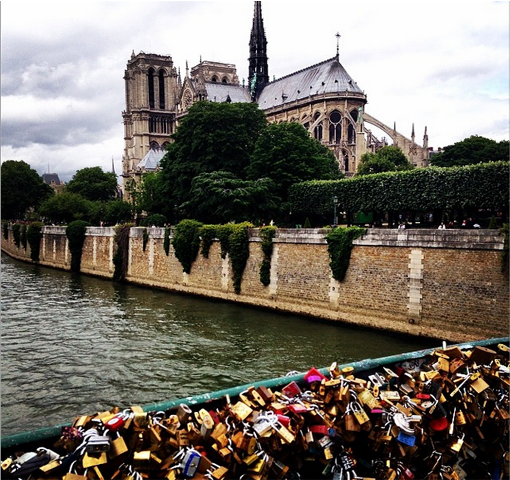 As they say, Paris is always a good idea. Cambodia is a county that I hold very dear to my heart. Having visited numerous times during my gap year and post-university travels, this is the country in Asia that I would recommend everyone visit. Despite a horrendous history and the majority of people still living in poverty, I am yet to visit a country where the people are kinder, the landscapes more charming and the pace of life more relaxed. 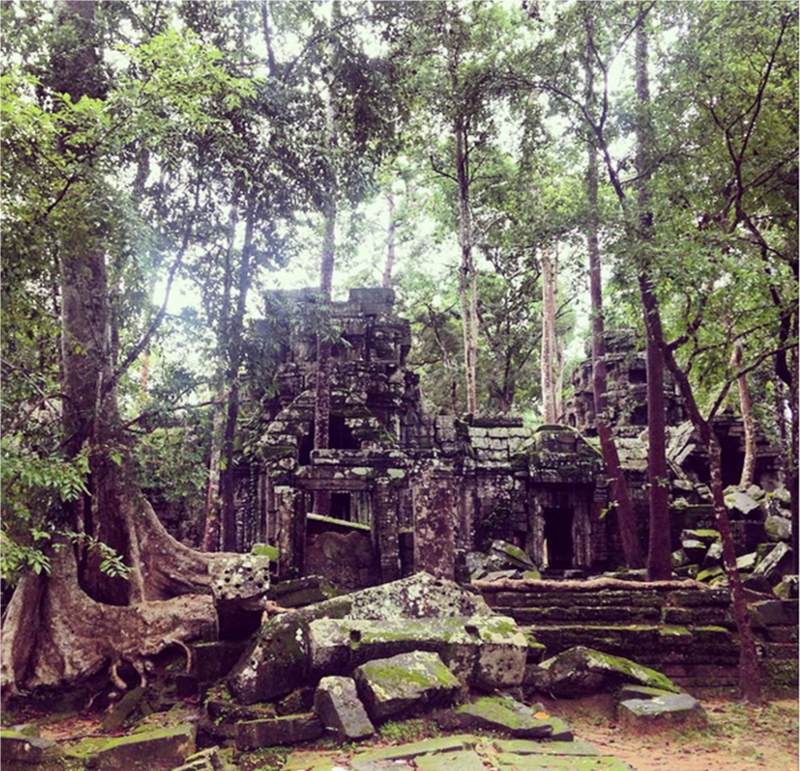 Siem Reap is the tourist capital of the country due to being the home of the Angkor temple complex. The largest religious monument in the world, it is hard not to be impressed by the site of Angkor Wat at sunrise. However, there are many gems to be found all around the temple complex, from taking sun-downers on the Bayon moat, trekking through the forest to discover an overgrown and crumbling temple all to yourself or spending an afternoon floating on Tonle Sap lake. Siem Reap is also home to a ridiculous array of luxury hotels. 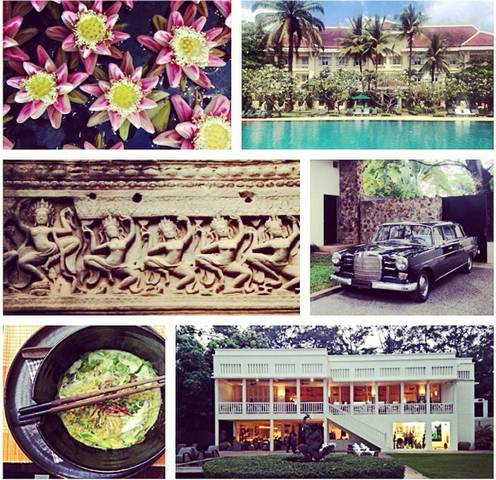 I was lucky enough to stay at both Amansara and Raffles Gand Hotel d’Angkor – which happen to be neighbours. Amansara was formally the King of Cambodia’s guesthouse (Jackie Kennedy was a guest) and comes with the perks one would expect from Aman Resorts; my minimalist suite came with private plunge pool and my own chauffeur-driven remork (the only way to get around). 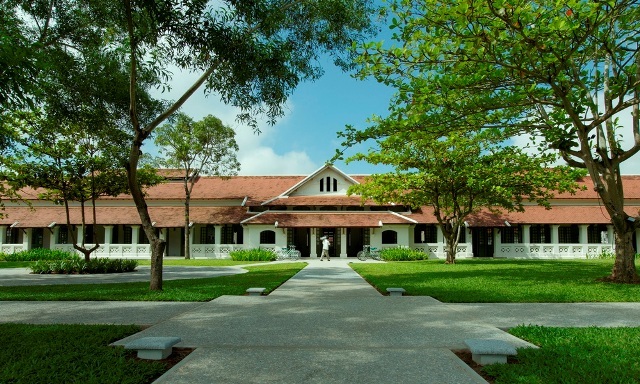 Raffles is everything Amansara isn’t; colonial and grand with lots of nods to its past as the first hotel in Cambodia. The swimming pool is the largest in Siem Reap and the perfect place to spend the afternoon; if you’re staying at one of the Cabana Suites it just metres away from your room. Other favourite properties in town included the Park Hyatt (a riot of sherbet colours and calm peaceful interior courtyards), Shinta Mani Club (the best boutique property in town), and La Residence – which is classic Belmond; all teak wood, lush greenery and gorgeous pool. I’ve been to Thailand several times, doing both the classic backpacker ‘trahv-ling’ and the ‘fly and flop’ week at a luxury hotel. This time was a little different; as part of a trip organised by the amazing Aman Resorts I was lucky enough to experience the iconic Amanpuri. 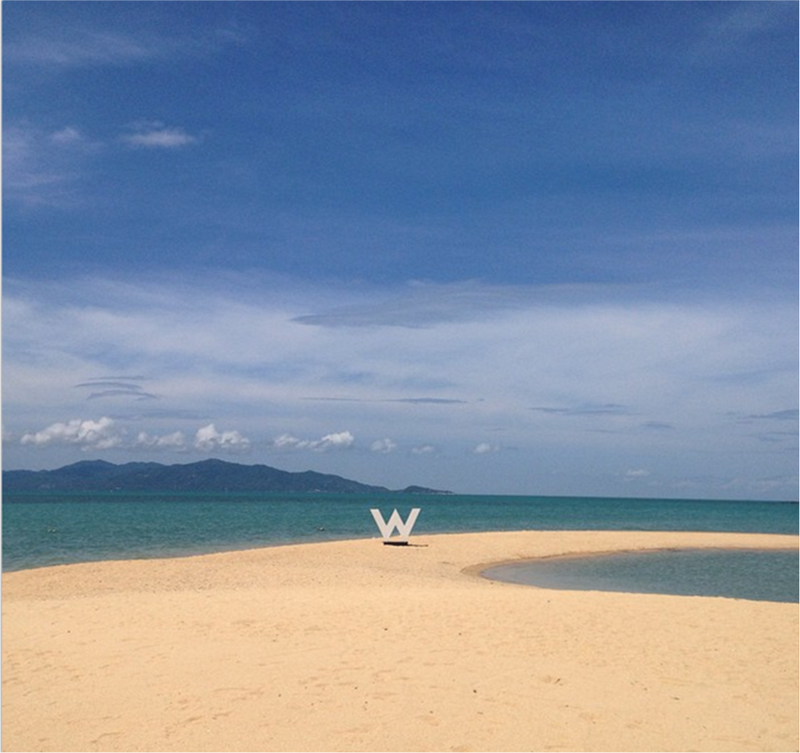 The first property to be opened by Adrian Zecha, back in 1988, Amanpuri is an almost mythical beach hotel – this is where Kate Moss comes to escape the winter blues, where Leo takes one of the hilltop villas (the one I visited had no less than 9 bedrooms) and where the New Year’s Eve parties are legendary. I was lucky enough to spend two nights here; I brunched on Italian parma ham, avocado and poached eggs while overlooking the famous swimming pool, took a day trip to the nearby James Bond island on Amanpuri’s private yacht (Aman I) and swam in the ocean at the resort’s secluded bay. 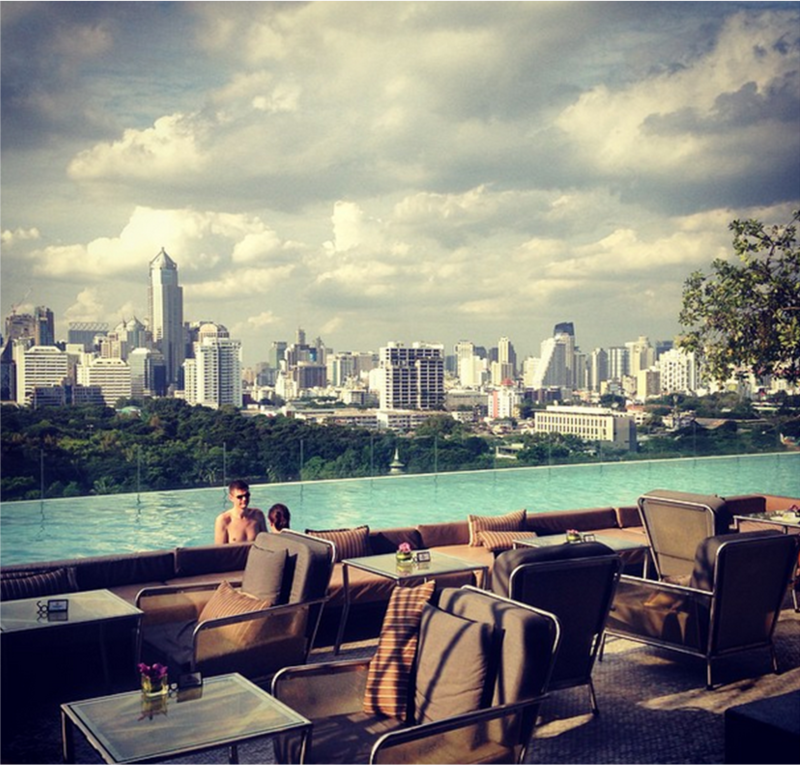 If that wasn’t enough my trip also included two nights in Bangkok – one of my favourite cities on earth (you’ll be hard pressed to find somewhere more fun) – one of which I spent at The Oriental, a hotel that is consistently voted one of the best in the world. Unsurprisingly, I, like many guests before me, fell for the grand dame’s charms; I loved taking breakfast by the river, taking a private boat across the Chao Praya to the hotel’s gorgeous spa, tucking into a Thai lunch in one of the poolside cabanas and celeb-spotting in the lobby (I swear I saw Bradley Cooper). For romantic river views you have to dine at Le Normandie and for a memorable (although quite touristy) experience take Afternoon Tea in the original wing. Other highlights of Bangkok was a rather raucous dinner at Sirocco (located on the same rooftop as one of my top-rated rooftop bars Sky Bar), visiting The Siam, a beautiful riverside boutique hotel, looking out over the city from the outdoor swimming pool at the new So Sofitel and sampling the weird and wonderful Thai / Indian fusion food at a quirky roadside restaurant that only a local would know. Thailand remains a country that really has it all – food, fun, beautiful beaches and buzzing cities, and is one that never fails to disappoint. When I stumbled across the sleepy riverside town of Luang Prabang on my gap year I knew that I had found somewhere special (I say ‘stumbled’ – it took a 13 hour coach ride from the country’s capital to get there). A stay that was meant to be three days quickly became a week, and my friend and I were heartbroken to leave the town’s infectious sense of relaxation and sleepy calm. I was thrilled therefore to discover that I would be returning as part of my tour of South East Asia with Aman Resorts to stay at Amantaka – an absolute haven of peace and tranquility. One of the main highlights of my short stay included an al fresco dinner under the stars by the hotel’s beautiful swimming pool. Hosted by the Prince of Laos (an honour in itself), the dinner began with a traditional Laotian ‘baci’ ceremony and was accompanied by an incredible dance performance. Other highlights included rising before dawn to participate in the daily alms-giving to local monks, doing a tour of the town by bicycle (one of the best ways to get around this UNESCO World Heritage Site), finding beautiful bargains in the night market (the Laotian people are so friendly and easy-going that haggling is nowhere near as stressful as in Vietnam, Thailand or India), and discovering Alix de Fautereau’s atmospheric and exotic murals in the Royal Palace. Amantaka itself was the perfect place to stay; both very central (you can walk to the market in minutes) but located on a quiet plot of land. This former palace (then colonial hospital) can only be described as the pinnacle of colonial chic (read more about my favourite colonial-style hotels here). A white washed main building leads out to a spacious courtyard, incredibly photogenic main swimming pool and a host of blocks each made up of several suites, some of which come with their own private pools. Shaded verandas, leafy gardens, teak furniture and a beautiful muted palette of greys, blues and greens makes this the most stylish retreat in town. I already can’t wait to go back! Vietnam is a country that I’ve been lucky enough to visit before, but unlike last time, when I was a cash-strapped back-packer, this time I did it in real style. We flew in from Bangkok and stayed our first night at The Sofitel Metropole in Hanoi (one of my favourite colonial era hotels in the world), a superstar of a hotel that has hosted everyone from Brad Pitt and Angeline Jolie to Graham Greene and Charlie Chaplin in its time. A beautiful French colonial building which is walking distance from the lake and the city’s old town, this is the best place to stay in the city. 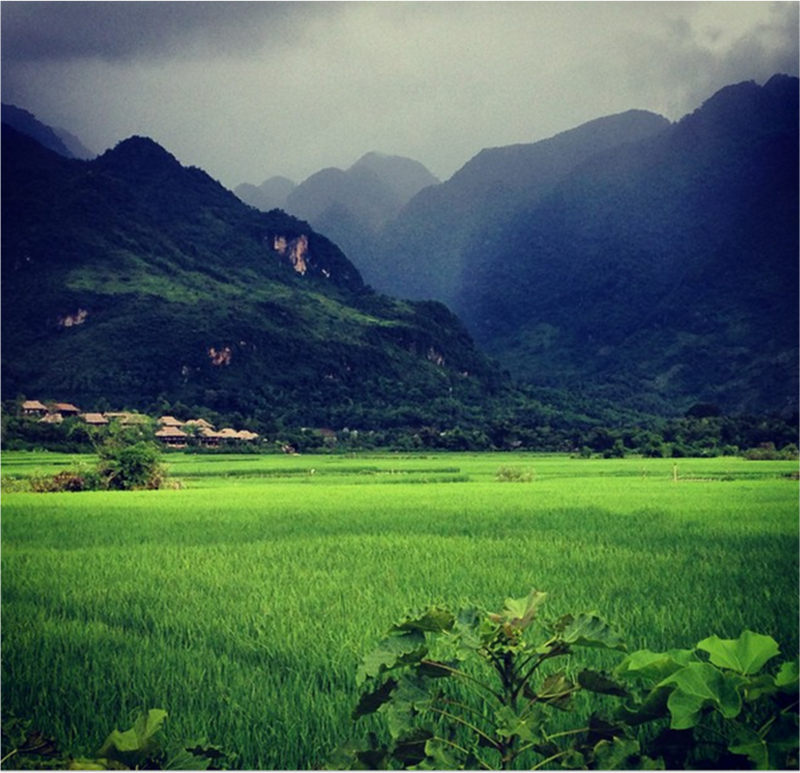 After a sweeping tour of Hanoi, including a cyclo tour and a trip to the puppet theatre (and lots of delicious food) it was off to Mai Chau, a small town located in rural Northern Vietnam. Ridiculously green and lush, this small town is a million miles away from the country’s bustling and slightly crazy (but wonderful) cities. 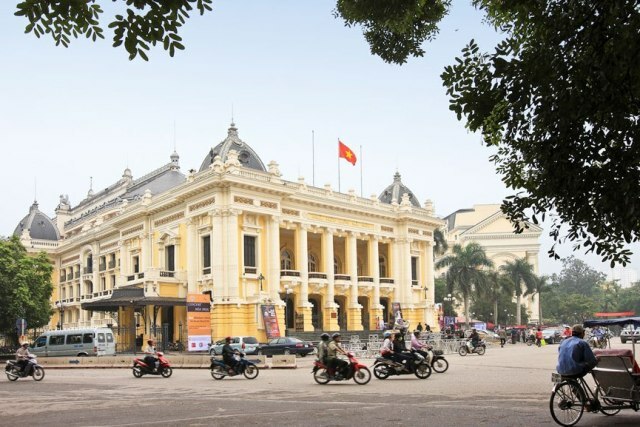 Next on whistle-stop tour was Saigon (Ho Chi Minh City), a city which definitely feels more Western than Hanoi – its streets are French-style wide boulevards lined with grand colonial-era buildings, a stark comparison to the narrow and winding lanes of old Hanoi. 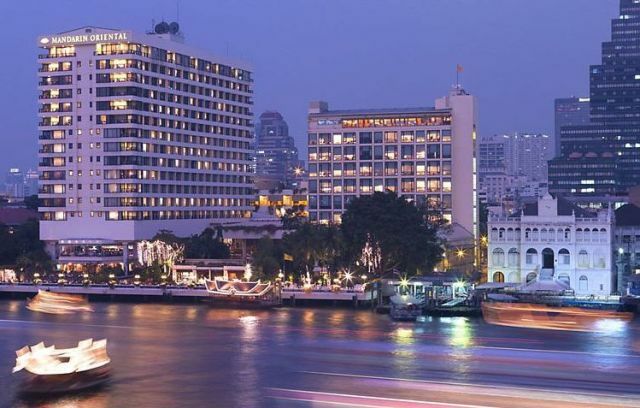 The best hotel in town is the Park Hyatt, a great contemporary property that is located in the very heart of the city, steps away from the Opera House, the Saigon Central Post Office and Notre Dame Cathedral. Highlights of my time in Saigon included dinner at an authentic al fresco BBQ restaurant frequented by Vietnamese hipsters and getting the chance to experience the AO show, Vietnam’s take on Cirque de Soleil; a highly entertaining evening combining dance, acrobats and circus acts, all in the recently refurbished Opera House (now known as the Municipal Theatre). Vietnam certainly isn’t a country for everyone; it can seem harsh and brash at times and everything is done at super speed (whether it’s getting around town on motorbikes, wolfing down a bowl of the country’s national dish ‘pho’ or bartering in the market). However it’s unique culture (a blend of China and South East Asia), intriguing cities, simply delicious food and staggering natural landscapes (Halong Bay is a must-see) make it quite unlike anywhere on earth. 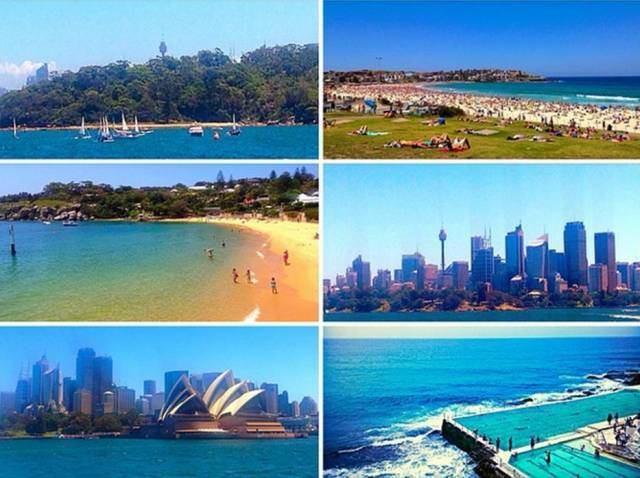 I first visited Australia in 2010 and ever since I have been desperate to go back; as far as I am concerned Sydney is one of the world’s best cities and my idea of paradise. The unbeatable combination of endless blue sky, glittering ocean as far as the eye can see, enough beaches to keep you busy all year round, amazing food and restaurants, fantastic architecture (both old and new), walks that make you feel like you’re in the countryside (although just minutes from the centre of town) and the friendliest people you’ll find on earth , it’s pretty hard to beat. I was lucky enough to be in town for New Year’s Eve and watched the fireworks from the Botanical Gardens – this provided a full 180 degree view, complete with reflections in the harbour – a once in a lifetime experience that I will never forget. During my short (but very sweet) stay I sunbathed on Bondi and Tamarana beaches, re-did the Spit to Manly walk (an absolute must), munched on raw toast at Bondi Whole Foods, explored the coastal walk from Bondi to Coggee (followed by lunch at the fab Coggee Pavilion) and generally just had the best time ever. The rest of my holiday was spent exploring Melbourne, another fantastic city and also the base for visiting a whole host of places including the Great Ocean Road. We broke the journey in a small town called Forrest, where we were lucky enough to stay at the Forrest Guesthouse, a small and unassuming, but absolutely brilliant B&B with Ottolenghi style food (totally unexpected and mouth-wateringly good) and cosy rooms. We also explored vineyard country just outside Melbourne, had an excellent lunch at The Whispering Vines Cafe and spotted a few wild kangaroos in the bush. The highlights of Melbourne itself had to be the coffee (my favourite place, after a lot of sampling, was Toby Estates), the food (we were lucky enough to spend Christmas Day at the fantastic The Atlantic, which I would recommend to anyone), the Botanical Gardens, the gorgeous Como House, Italian cafes and delis in around Lygone Street and the incredibly friendly people – nothing is too much to ask the Melbournians, and they’ll always go out of their way to do absolutely everything for you. It may take a long time to get there, but going down under is a must. 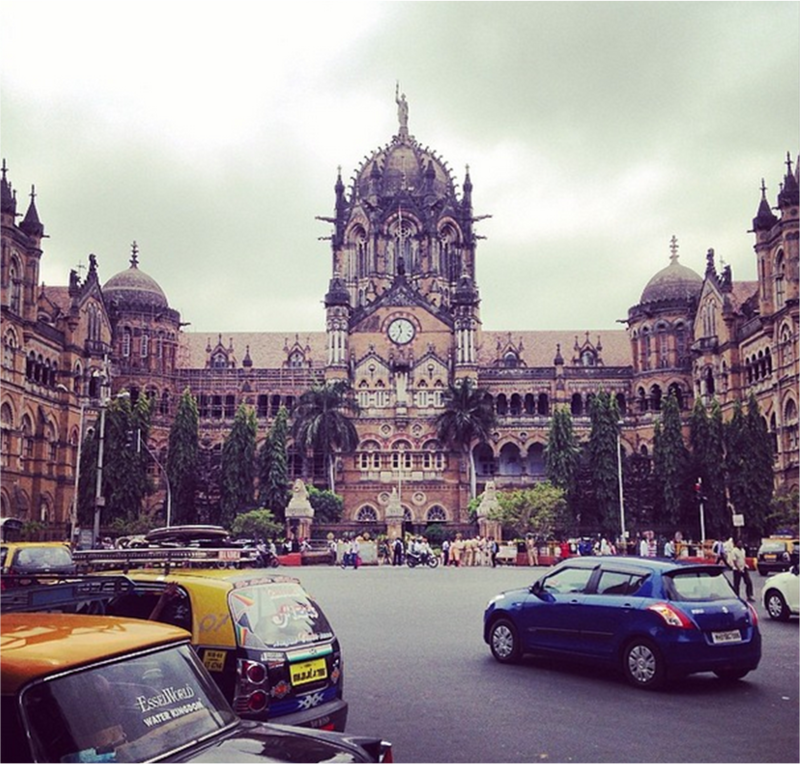 For my third trip to India I designed a whirlwind tour of the country’s ‘metro’ cities; Mumbai, Delhi, Hyderabad and Calcutta. Despite travelling in the so-called low season, my trip was a complete delight. In Mumbai (or Bombay) I re-did a walk around the heritage district to admire the city’s best colonial architecture (fantastic even in 40 degree heat), dined on ‘Bombay Snacks’ at the Taj Mahal Palace’s Sea Lounge and spent glorious afternoons at the hotel’s famous swimming pool. I also looked around The Oberoi and The Trident, both of which have sensational views over Marine Drive and the glittering city below (The Oberoi’s Presidential Suite is just jaw-dropping). In Delhi, in the company of an excellent guide (and fifty degree heat!) I discovered Shah Jahan’s Red Fort and experienced the feeding off thousands of people at a Sikh Gudwara – an inspiring and heart-warming daily occurrence organised entirely my volunteers. Normally a patron of Art Deco classic, The Imperial (one of my very favourite colonial-era hotels), I decided to give The Leela New Delhi a go for my stay this time. Although luxurious and opulent and a wonderful insight into the ‘new’ India, I missed the central location of The Imperial and it’s old world charm. I also loved The Lodhi (formally the Aman New Delhi) and was impressed by their enormous spa and exciting contemporary art collection. In Calcutta I saw Gangetic dolphins as I sailed the Hoogly River at sunset and read about the short lives of East India officers in the atmospheric and simply magical Park Street Cemetry. 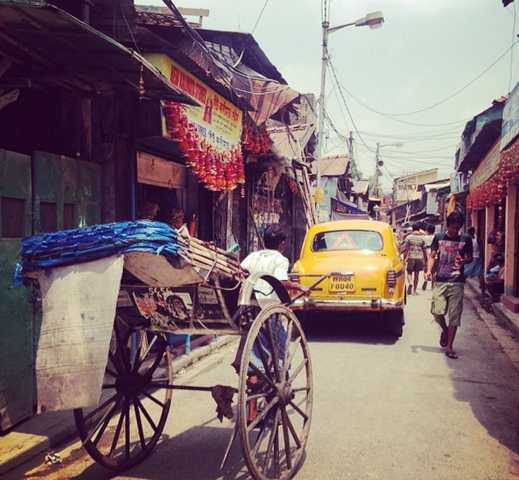 When in Calcutta there is only one place to stay – the historic Oberoi Grand hotel. Blessed with world-class service, this is a property that is a perfect metaphor for Calcutta itself; slightly stuck in the past, an intoxicating blend of British colonial history and 21st century India, eccentric, ridiculously charming and simply one of a kind. However, the undisputed highlight of my trip had to be the phenomenal Falaknuma Palace in Hyderabad, a hotel that I would describe as one of the best in the world (I was so mesmerized by my stay at Falaknuma that I dedicated a whole blog post to it). There is not better place to stay to learn about (and immerse yourself in) the indulgent and opulent lives of the Nizams – Hyderabad’s royal family for several hundreds of years. As with all my previous visits, India charmed the socks of me, shocked, inspired and enlightened me and remains my favourite country in the world. Anyone who lives in the UK will know the dread that falls like a heavy cloud over the first months of the year; dark mornings and short afternoons, bitter cold, non-stop rain (or at least it feels like that) and a severe case of post-Christmas blues. To combat the most depressing week of the year, three girlfriends and I wisely booked a long weekend to Marrakech back in September when the summer was coming to an end and we knew winter wasn’t too far around the corner. Mr & Mrs Smith provided a long list of gorgeous riad’s and boutique retreats to choose from; after much discussion we decided on the recently opened Fellah Hotel. 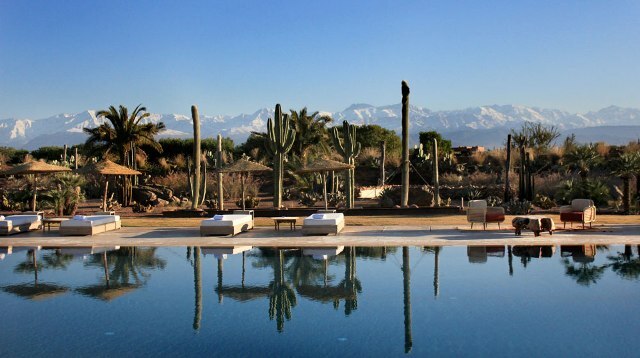 Located outside the city, and south towards the Atlas Mountains, this was the just the place for a girls’ weekend. We sunbathed under palm trees looking out over snow-capped peaks, soaked in our al fresco bath under the stars, snuggled up in our enormous bed for a DVD and room-service session and made the most of the never-ending deep blue sky – a sky which seems larger and more expansive than anywhere else in the world. I also took some time to visit some of the city’s best hotels; I had lunch at the sublime Amanjena (part of Aman Resorts), took a tour of the Four Season’s Marrakech (very much a resort hotel, but offering every facility and creature comfort you could wish for you – including kid’s pool, health centre and lots of restaurants) and fell head over heels in love with the Le Royal Mansour – a hotel so luxurious, intricate and beautifully done that you actually feel like royalty. The quality of everything from the chandeliers, carpets, wall fittings and furniture is the very best of the best; Le Royal Mansour makes you feel as if you are staying in both a functioning royal palace and world-class museum at the same time. Suites take the form of your own private riad, some of which have private rooftop plunge pools and terraces looking over the rooftops of Marrakech (read more about my weekend here). What I love most about Marrakech is that from London it is a short three hour flight to get there, but you land in a different country, a different continent, and a completely different world. For somebody looking to forget everything at home, just for a couple of days, without breaking the bank, then this is the place for you. November surprised me with a last-minute weekend away to Singapore. Yes, the concept sounds crazy but it can be done, and was done in style as I was lucky enough to have had my trip organised by Raffles Hotels, Qatar Airways and the Singapore Tourist Board. 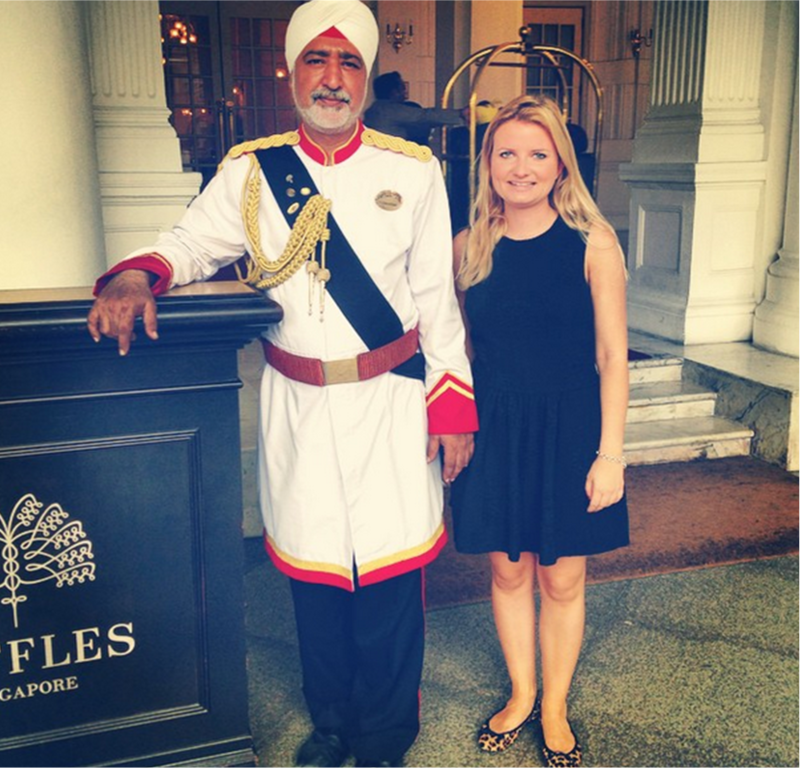 I don’t think I’ve ever had a more indulgent three days; at Raffles I stayed in my own suite, complete with dedicated butler, sampled the hotel’s famous afternoon tea, incredibly enticing buffet breakfast (try the dim sum! ), sipped on iconic ‘Singapore Sling(s)’ and was treated to an amazing dinner with the General Manager – a lovely evening which has disappeared behind a slight Billecarte Salmon haze (Raffles Singapore is lucky enough to have a limited edition private label cuvee which we of course were ‘obliged’ to try out). 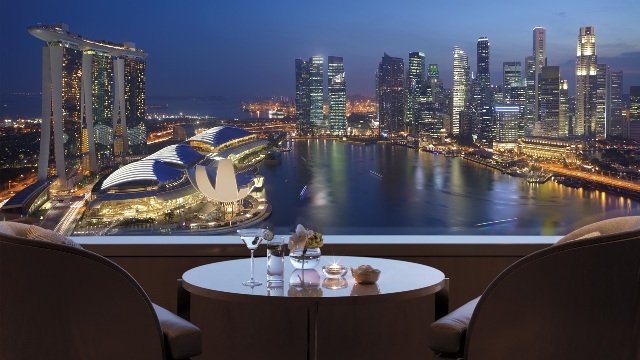 Other great properties in the centre of town that I loved included the Fullerton Bay Hotel (their rooftop bar – Lantern – is fantastic and is home to an insane swimming pool) and the Ritz Carlton (for spectacular views over Marina Bay Sands from your bathtub). We also managed to fit in an impressive amount of sightseeing; we visited the Avataresque ‘Gardens by the Bay’ (an absolute must), discovered China Town, walked through urban parks, visited Sentosa Island (where I had lunch at the gorgeous Capella Hotel), took in the view of Marina Bay, shopped on Orchard and ate and drunk as if it were our last few days on earth. It would be impossible to list all of the places we were lucky to sample but a few of the highlights include cocktails at LeVeL 33 (a view to actually take your breath away), dinner at Halia in the heart of the botanical gardens and sampling a whole host of Asian cuisines at Lau Pa Sat. Singapore is the ultimate foodie destination – look no further for your next holiday if your favourite pastime is munching your way around a city. On top of food glorious food, Singapore is the land of glittering skyscrapers, colonial architecture, interesting history, a beautifully warm tropical climate, lush green parks, incredible hotels and easy air connections to a host of global cities – go now! 2014 also took me to Berlin, Austria, Wales and Ibiza – it was a year that will be hard to beat and which I’ll always remember. On the agenda for 2015 is a weekend to Oxford (one of my favourite cities in the UK), a long weekend of skiing in the Swiss Alps (Verbier this time), a country-wide tour of Ireland, summer in the South of France, a weekend in New York and my fourth visit to India in as many years. Watch this space for my adventures and thanks for reading in 2014! A lot of our favourite places on this list. Melbourne is definitely an incredible city. Been here 13 months now.